Rocked & Rolled for Your Enjoyment! 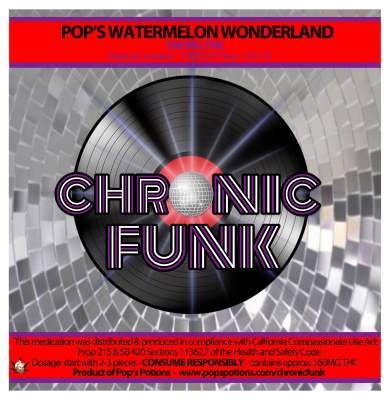 Chronic funk is a product of pops potions. Those who know pops potions know the story of our Jim. This is a step further in the direction of helping people as Jim would see fit. Jim was a Vietnam vet. When he came home and met Debbie they built their lives around the hippie ideal. They loved rock and roll and nature. He was a hard working man who supported his family while Debbie stayed home. They were happy but there was just not enough "extra" money each month. They always had what they needed but worked hard for what they had. They would have never been able to afford some of the medibles out there today. At chronic funk this is important to us. We want everyone to be able to afford medicine. So, to accommodate this, all of our portions are small. This way more people can afford medicine so our packages are half size. Our small candies come with 16 and the large contain 8. 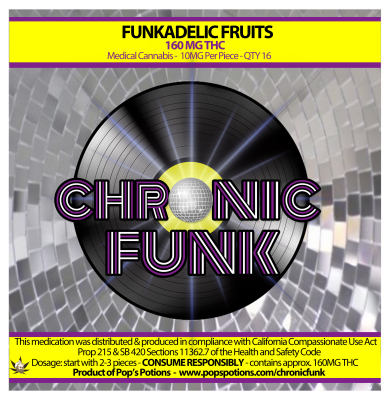 At chronic funk we use the same high quality oil as we do for pops potions but we also put it thur our proprietary "rocked and rolled" technique. This assures all medicine is evenly distributed to each piece of candy. We also have a very tasty sugar free peach ring. All small candies are approximately 10 mg per piece and large candies contain approximately 20 mg.